Shane Victorinos grand slam vs. the Brewers in Game 2 of the NLDS is the former Phillies' signature playoff moment. Growing up in Wailuku, Hawaii, Shane Victorino figures he knew two things about Philadelphia. "That it's cold," he said by phone this week, "and, obviously, Rocky. Other than that, that's it." But you don't go from the island of Maui to the big leagues — or become one of the best Hawaii-born players in baseball history — without perseverance, boundless energy, and a work ethic defined by unrelenting hustle — qualities that Philadelphians value in their professional athletes. Without those things, there's a chance Victorino would have quit playing in 2003, when the San Diego Padres returned him to the Los Angeles Dodgers after picking him up in the Rule 5 draft. Or, in 2004, when the Dodgers demoted him to double A. But he definitely would not have become one of the most popular players on one of the most beloved teams in Phillies history. The love-fest between Victorino and his adopted city began midway through the 2006 season. It will continue Friday, when the "Flyin' Hawaiian" signs a one-day contract and retires as a member of the Phillies. Victorino has been unofficially retired for two years. His last game was May 17, 2016, for the Chicago Cubs' triple-A club. He hasn't played a major-league game since Oct. 4, 2015, for the Los Angeles Angels. But it wouldn't feel right to leave the game, the center fielder on the Phillies' 2008 World Series championship team said, without sharing it with the fans in the city that seemed to connect with him over the years. 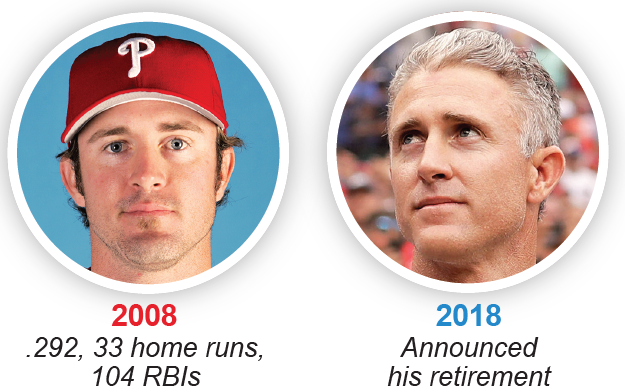 Chase Utley is one of three players from the 2008 Phillies championship team who announced they would retire this year. Click here for a look at how other key members from that team have fared since 2008. "I think back to when I came into the game, watching guys retire, they always seemed to go back to cities that embraced them and that they embraced just as much," Victorino said. "This was where I went from a young man to basically an adult, to the man I am today. It was all shaped by the city of Philadelphia." Victorino, 37, spent eight of his 12 major-league seasons with the Phillies. A switch-hitting outfielder with track-star speed and a missile-launching arm, he won three of his four Gold Glove awards here and was twice named an All-Star. In 987 games with the Phillies, he batted .279 and slugged .439, with a .345 on-base percentage, 63 triples, 88 home runs, and 179 stolen bases. He played a central role in vanquishing the Dodgers in the 2008 NL Championship Series. In Game 2, Victorino drove in four runs, then mourned the death of his grandmother. In Game 3, he touched off a benches-clearing brawl by objecting to a high-and-tight pitch from Dodgers starter Hiroki Kuroda. And his two-run homer in Game 4 preceded Matt Stairs' iconic go-ahead shot at Dodger Stadium. But Victorino's signature Phillies moment came earlier in the 2008 postseason. His grand slam off indomitable Milwaukee Brewers ace CC Sabathia in Game 2 of the division series was the moment that then-general manager Pat Gillick says he knew it was the Phillies' year. Most fans probably had the same feeling. "I think it was just not being afraid to fail," Victorino said. "If you go by the numbers, I'm set up to fail there. CC was immortal. Nobody was going to beat CC and the Brewers." 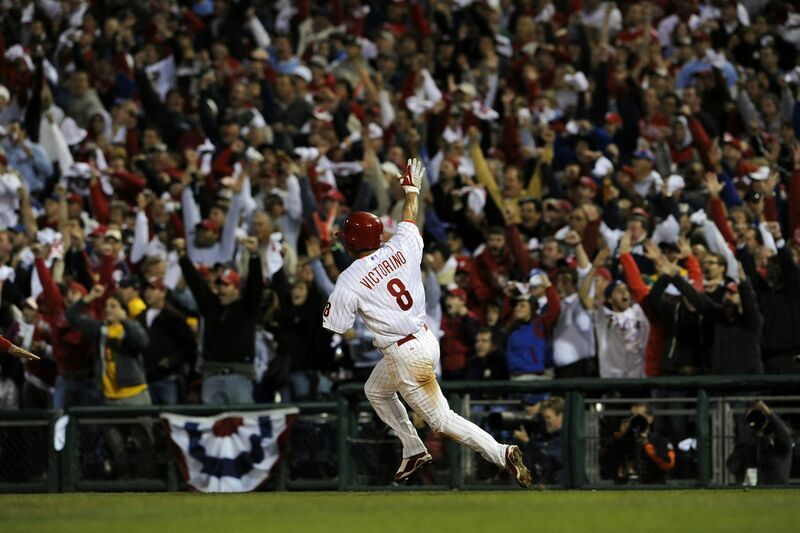 Most of all, Victorino symbolized what the Phillies were about during their run of five consecutive division titles. Chase Utley, Jimmy Rollins, Ryan Howard, and Cole Hamels were the big stars. But Victorino was the blue-collar catalyst who often found himself in the middle of everything. Victorino was an underdog, too. In addition to being exposed to the Rule 5 draft twice by the Dodgers, he had to learn how to cope with attention deficit hyperactivity disorder. His solution: channel his energy into his play. He buzzed around the field, catching everything in the outfield and creating havoc on the bases. And while some athletes wilt amid the insatiable passion for sports in Philadelphia, Victorino thrived on it, so much so that he signed as a free agent with the Boston Red Sox in 2013 because he wanted to play in another sports-obsessed, pressure-packed environment. "You read and you listen and you hear what people say about the people of Philadelphia, but to actually come here and embrace it and understand it even more, it's a special place," Victorino said. "It's a special group of people that love their sports, that love their city, that have so much pride. That's what made it great." Victorino saw the civic pride in Philadelphia and felt that he could relate. Hawaiians, he said, rally around the successes of other Hawaiians. He became active in the community, too. Among other things, his foundation helped to renovate a Boys & Girls Club in the Nicetown section of the city. Shane Victorino visits the Shane Victorino NicetownBoys & Girls Club of Philadelphia on Thursday. "There was definitely a connection for me to this city more than any other city I played in," Victorino said. "When I came here, it wasn't so much of a shell shock. It was just, how do I draw the city of Philadelphia into loving what I could bring to the table? The player that I am, the way I played the game, I think it definitely translated to the people here." This weekend, Victorino will get to feel that love once more. And, one last time, he wants to make sure he reciprocates. Shane Victorino celebrates his Hawaiian heritage while kissing the World Series trophy on Oct. 29, 2008. Wednesday, October 29, 2008 after the rain delay. Phillies podcast: It’s only April but ... when should we get concerned?